David Dunn playing Steina's Midi violin. Renowned composer, theorist, sound engineer, professor, speaker, researcher and current director of the Art and Science Laboratory, David Dunn is also the recipient of several awards. In 1999, this conceptual artist's CD-ROM Music, Language, and Environment: A Thirty Year Retrospective (IML) brought together his texts, musical scores, sounds and images. The indispensable catalogue Eigenwelt Der Apparatewelt (Ars Electronica, 1992)(1)was also created under his leadership. Like artists Robert Smithson and Michael Heizer, who left galleries and museums behind and explored the intersection between art and nature by producing monumental works known as Land Art, Dunn made his reputation when he left the recording studio for the natural world, to experiment with new sound and musical forms. In 1973, for example, he travelled with three trumpet players to the Grand Canyon, where they improvised over a three-day period with the spatial acoustics of rock formations and animals in the Canyon. He is a pioneer of what is now called "environmental music." At the heart of such research lies the question: can environmental sounds be considered music? He has since prepared numerous in situ performances, installations, soundtracks and radio programs, all while pursuing his bio-acoustical research. 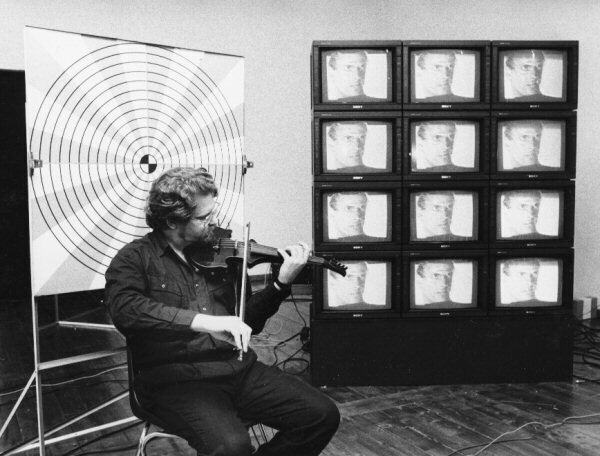 (1) Woody Vasulka, Steina Vasulka, Eigenwelt der Apparatewelt: Pioniere der Elektronischen Kunst / Pioneers of Electronic Art, Peter Weibel, artistic director; David Dunn, ed. (Santa Fe: The Vasulkas ; Linz: Ars Electronica Center, 1992).